All transactions are safe and secure with a reliable history in online purchasing behind each of our associates. 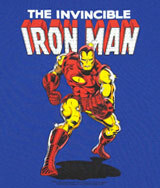 Buy the Invincible Iron Man t-shirt to own Iron Man clothing and merchandise. These attractive blue vintage Iron Man t-shirts pay homage to the character's comic book origins. Iron Man made his solo comic book debut in May 1968 with The Invincible Iron Man #1. Prior to this, Iron Man stories had been featured in the publication Tales of Suspense, which included anthology science fiction and supernatural stories. Wear this tee underneath your Iron Man costume. In addition to the Invincible Iron Man tee above, browse the Iron Man Clothing Gallery for more apparel like men's and women's clothes, kids shirts or hoodies.